Women owned and managed disposal services company with a combined 40 years experience, we provide exceptional customer service at a fair cost. We believe satisfied customers stay loyal customers. 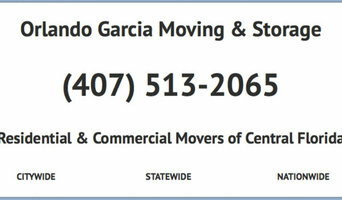 We offer maid service, pre and post construction clean up also provide hauling and junk removal services. 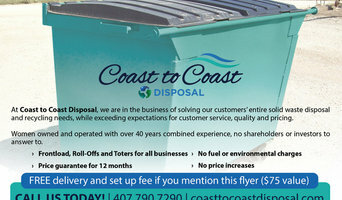 We are the areas only residential friendly mini dumpster rental service. Our dumpsters never touch your driveway cause we offer 100% driveway protection, our bin have easy access double doors, and we even sweep up before we leave. Love My Phone Repair <a rel="nofollow" target="_blank" href="https://www.lovemyphonerepair.com/iphone-repair-orlando">https://www.lovemyphonerepair.com/iphone-repair-orlando</a> lovemyphonesuite319@gmail.com (407) 837-6718 6550 International Dr Suite 112, Orlando, FL 32819 Love My Phone Repair is Orlando's #1 iPhone repair shop and Android repair shop. We repair phones, tablets, iPads, and more. Call us at to get your phone fixed in under 20 minutes. Veteran's Junk Removal & Hauling, LLC is based out of Mount Dora, Florida and will be serving the Lake, Orange, and Sumter County areas. It doesn’t matter where your junk is located; we will take it and dispose of it the correct way. Before leaving, we will clean your area and make sure not to leave a speck of dirt behind. We get the job done, whether it’s commercial or residential. Our three core values of Respect, Integrity, and Commitment to our customers form the foundation on which our company operates and builds upon. Our company is owned and operated by a United States Marine veteran, who served from 2000-2004, and his wife. Our owner served his country in both Operation Enduring Freedom and Operation Iraqi Freedom. What services do Orlando, FL rubbish removal professionals provide? Even if you think you are going to produce minimal waste during your renovation project, you’ll be surprised at how much can build up, and with strict fly-tipping laws in the UK it’s much safer to choose skip hire or hire a waste disposal professional Orlando, FL to deal with any rubbish clearance. There are many situations where it’s best to hire the services of an Orlando, FL rubbish removal company. You’ll be able to hire a company to come in and do a full house clearance for you if you’re completely gutting a house and starting afresh, or if you’re landscaping your garden there will be professionals who can deal with garden rubbish removal, and for everything else there are Orlando, FL skip hire companies and smaller waste disposal services that can remove furniture, old wallpaper, carpets and all the miscellaneous bits and bots that you might accumulate. If you need a skip, try to estimate how much you will be throwing away. You can arrange large, midi or mini skip hire; just talk to your Orlando, FL skip hire professional about what sizes they offer and what the different sizes can hold in terms of waste disposal. The company will arrange delivery and collection of the skip once you’re finished with it, so you won’t need to worry about the rubbish removal. Find rubbish removal and skip hire professionals on Houzz. 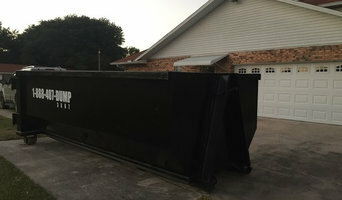 Narrow your search by postcode for a list of Orlando, FL skip hire and waste disposal services. Get contact information so you can ask about prices and read customer reviews to find the best Orlando, FL skip hire and rubbish clearance service for your home improvement project.